Show off your style with this beautiful piece from Pfister. Turn your bathroom into a stylish space with this single-control faucet. Its deck mounted design fits with many sinks and isn't hard to install. This faucet is WaterSense certified for less water use to give you the same clean. This piece from Delta has an all-around look that works well with many bathroom styles. Turn your bathroom into a stylish space with this dual-control faucet. This item's deck mounted design is easy to set up so you can enjoy a finished counter top. This faucet is also WaterSense certified to help you and the environment stay clean. This piece from GLACIER BAY has an all-around look that works well with many bathroom styles. This single-control faucet has a timeless design that looks great in any bathroom. This item's deck mounted design is easy to set up so you can enjoy a finished counter top. This WaterSense certified faucet uses less water but gives you the same clean every time. With its fluid curves the GROHE Agira Bathroom Faucet Centerset remains the smart, best-value choice for bathroom projects large and small. Its unspoiled design is matched by unique GROHE technologies including GROHE SilkMove and GROHE StarLight finish for scratch and tarnish-resistant surfaces for a lifetime of beauty for an intense shine. It is a covetable combination of craftsmanship and pristine style. An elegant finishing touch to traditional decor, Antique faucets and accessories bring nostalgic charm to bath and powder rooms. This sink faucet features a single-control lever handle for ergonomic control. 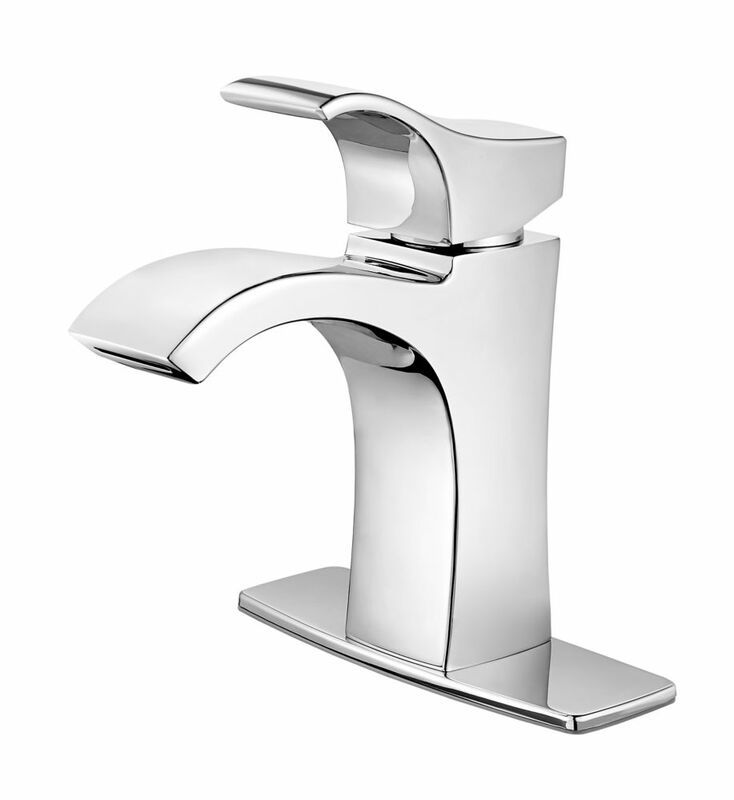 Venturi Single Hole 1-Handle High Arc Waterfall-Flow Bathroom Faucet in Chrome with Lever Handle Show off your style with this beautiful piece from Pfister. Turn your bathroom into a stylish space with this single-control faucet. Its deck mounted design fits with many sinks and isn't hard to install. This faucet is WaterSense certified for less water use to give you the same clean. Venturi Single Hole 1-Handle High Arc Waterfall-Flow Bathroom Faucet in Chrome with Lever Handle is rated 4.3 out of 5 by 48. Rated 5 out of 5 by DH from Love this faucet!... Love this faucet! Rated 1 out of 5 by na from Although the faucet was beautiful it did not work. I had it professionally installed. When we ... Although the faucet was beautiful it did not work. I had it professionally installed. When we turned the water on wide open it trickled out of the cold and only dripped out of the hot. I returned it. Rated 5 out of 5 by Lynnoe from Looks beautiful and easy installation. ... Looks beautiful and easy installation. Rated 4 out of 5 by Julie from I love the design of this faucet, however, the water... I love the design of this faucet, however, the water flow is a bit meager. Rated 5 out of 5 by Randy from We love the way it looks and it was easy... We love the way it looks and it was easy to install. Pfister model # F042VNCC comes with optional 5 &frac34;&rdquo; deckplate for installation. Pfister does not manufacture a 8&rdquo; single hole deckplate. Please contact or visit your local Home Depot special order counter for alternate options, pricing and availability.